Invasive toads reduce the parasite burden of native frogs in Australia, but is it doing them any good? A recent study has shown that the invasive cane toad, Rhinella marina, may reduce lungworm burdens in native Australian frogs. Invasive (or alien) species are considered species, that may include animals, plants or pathogens that have been introduced to a location beyond their native range and cause environmental or economic damage or harm to human health in that region. The methods of introduction of these species to new locations are varied. They may be transported on the hulls of boats, fishing gear or by other vehicles or have escaped from private collections. They may also have been released deliberately for sporting reasons (e.g. fishing or hunting) or reached new locations via the alteration of land or waterways. You may also have seen public warnings about cleaning equipment or vessels you have used in other locations to avoid transporting any unwanted guests back to your home country. The impacts of invasive species in their new ecosystems when they arrive are as varied as their methods of arrival. They can spread new parasites and diseases to native species, directly predate on individuals, compete with native species for resources, or impact on habitats and structures to cause monetary loss. Consequently, the impact of invasive species on native ecosystems is of considerable scientific interest and concern. cane toads, Rhinella marina, (previously Bufo marinus), were deliberately introduced to Queensland in the north east of Australia in 1935. Native to Central and South America, these large, prolific, toads were introduced as agents of biological control in the hope that they would control populations of cane beetles that were damaging the sugar cane industry. Adult cane beetles (Dermolepida albohirtum) feed on the leaves of sugar cane, whilst the larvae eat the roots, killing the plants or stunting their growth. However, since the initial introduction of cane toads in 1935 they have spread rapidly across the north east of Australian with widespread impacts on local ecosystems. These toads are toxic throughout their life cycle from eggs, through to tadpoles and to adults at which stage they secrete a toxin from specialist glands on their shoulders. Many native species try to consume these toads as prey and subsequently succumb to the toads’ toxins and impacts have been observed on the populations of a wide variety of species including crocodiles, lizards, marsupials and snakes. The role of cane toads in the disruption of native frog host-parasite dynamics has also been a focus of research. Recently it was observed that native frogs and introduced cane toads are infected with separate lungworm species. Frogs are infected with the native Rhabdias hylae whilst cane toads are infected with Rhabdias pseudosphaerocephala a non-native lungworm that arrived with their cane toad host. It has also been observed in the wild that native frogs have lower lungworm burdens in areas where cane toads are present than in nearby areas where cane toads are absent, leading to the assumption that cane toads must be reducing infection rates in native frogs. Juvenile Cyclorana australis (photo: B. Maryan) A native frog species included in the study. A recent study in the International Journal for Parasitology: Parasites and Wildlife set out to identify the possible mechanism behind this relationship. They hypothesised that cane toads may take up the native lungworm R. hylae but that as they do not survive in cane toads those lungworms are removed from the population and as such fewer are available to infect native frogs. To examine this, they set up lab experiments infecting both toads and native frogs with native R. hylae lungworms. They placed a known number of infective R. hylae larvae in arenas and exposed either cane toads or each of two species of native frogs to the lungworm larvae for 1 hour. They then removed the subject and counted the number of larvae remaining (thus measuring uptake). They then placed either the same species or one of each of the other species in the chamber for another hour, removed the subject and again counted the number of larvae remaining (thus measuring uptake by the second host). Importantly, they found that cane toads did take up native R. hylae larvae in comparable amounts to native frogs and that individuals of all species had reduced larval uptake upon exposure for the second time. As R. hylae cannot survive in toads, their study supports the hypothesis toads are acting as a “sink” or “dead end host” for a proportion of the R. hylae lungworm population and that this likely results in a reduction in the lungworm burden in native frogs. Although a reduction in parasite burden in native Australian frogs due to cane toad presence sounds like good news against the back drop of the many negative impacts the introduction of cane toads has had, things may not be so simple. 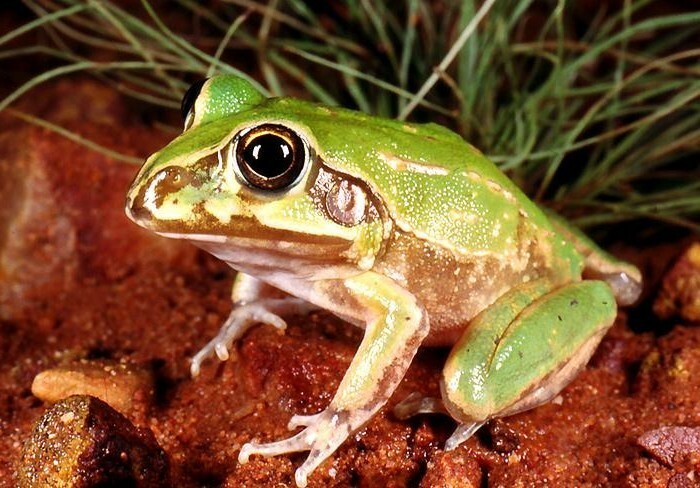 Other recent studies have shown that R. hylae may have limited impacts on native frogs and that the presence of cane toads may not affect native frog populations (i.e. there may be no observed benefit from this reduced parasite burden). Therefore, it is currently unclear whether this invasive toad will benefit the native anurans of Australia. The Revenge of the Ticks!